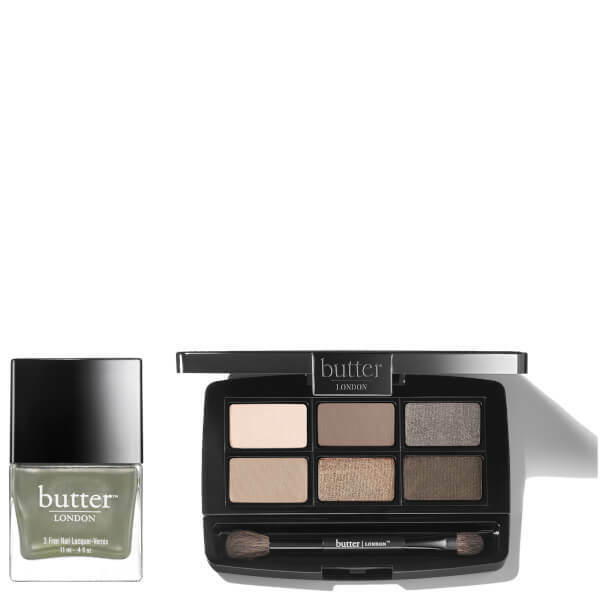 The Sloane Ranger Set from butter LONDON combines a fast-drying nail polish and a sleek eyeshadow palette that will leave you ready for any occasion. A high-pigmented, vitamin-rich nail polish in an olive grey crème. Infused with Horsetail Extract and Hydrolysed Silk, the nail varnish promotes stronger, healthier nails, whilst delivering long-wearing, chip-resistant colour with mirror-like shine. Applies effortlessly for even, one-stroke coverage. Free from Formaldehyde, Formaldehyde Resin, DBP, Toluene, Camphor, Ethyl Tosylamide, Xylene and TPHP. Combining six cool-toned, neutral eyeshadow shades, you can create endless eye makeup looks with superior colour pay-off and seamless blendability. Melting effortlessly onto the lids for smooth, even application, the high-pigmented, ultra-fine milled powders feature a built-in, oil-absorbing primer for a long-wearing, crease-resistant finish. Housed in a mirrored compact with a dual-ended brush for use on-the-go. Nail Polish: Apply one coat of lacquer, let dry. Apply second coat. Palette: Start by gently patting the first shade onto your eyelids with a brush. Blend to achieve desired look. Nail Polish: Butyl Acetate, Ethyl Acetate, Nitrocellulose, Acetyl Tributyl Citrate, Adipic Acid/ Neopentyl Glycol/ Trimellitic Anhydride Copolymer, Isopropyl Alcohol, Styrene/Acrylates Copolymer, Stearalkonium Bentonite, Silica, N-Butyl Alcohol, Benzophenone-1, Diacetone Alcohol, Trimethylpentanediyl Dibenzoate, Polyethylene, Phosphoric Acid, Ascorbyl Palmitate, Tocopheryl Acetate, Calcium Pantothenate, Glycerin, Equisetum Hiemale Extract, Hydrolyzed Silk, CI 77891 (Titanium Dioxide), CI 11266 (Black 2), CI 19140 (Yellow 5 Lake), CI 15850 (Red 6 Lake), Bismuth Oxychloride (CI 77163). Chantilly Lace: Mica, Talc, Boron Nitride, Nylon 12, Silica, Polyethylene, PTFE, Zinc Stearate, Octyldodecyl Stearoyl Stearate, Diisostearyl Malate, Sodium Dehydroacetate, Phenoxyethanol, Sorbic Acid, Magnesium Myristate. May Contain: CI 77891 (Titanium Dioxide), CI 77491 (Iron Oxides), CI 77492 (Iron Oxides), CI 77499 (Iron Oxides), CI 77742 (Manganese Violet), CI 75470 (Carmine), CI 77007 (Ultramarines). Suede: Talc, Boron Nitride, Mica, Nylon-12, Silica, Polyethylene, PTFE, Zinc Stearate, Octyldodecyl Stearoyl Stearate, Diisostearyl Malate, Sodium Dehydroacetate, Phenoxyethanol, Sorbic Acid, Magnesium Myristate, CI 77891 (Titanium Dioxide), CI 77491 (Iron Oxides), CI 77492 (Iron Oxides), CI 77499 (Iron Oxides), CI 77742 (Manganese Violet), CI 75470 (Carmine). Brocade: Mica, Octyldodecyl Stearoyl Stearate, Talc, Diisostearyl Malate, Boron Nitride, Zinc Stearate, PTFE, Nylon-12, Silica, Polyethylene, Sodium Dehydroacetate, Phenoxyethanol, Sorbic Acid, Magnesium Myristate, CI 77891 (Titanium Dioxide), CI 77491 (Iron Oxides), CI 77492 (Iron Oxides), CI 77499 (Iron Oxides). Cashmere: Mica, Talc, Boron Nitride, Nylon 12, Silica, Polyethylene, PTFE, Zinc Stearate, Octyldodecyl Stearoyl Stearate, Diisostearyl Malate, Sodium Dehydroacetate, Phenoxyethanol, Sorbic Acid, Magnesium Myristate. May Contain: CI 77891 (Titanium Dioxide), CI 77491 (Iron Oxides), CI 77492 (Iron Oxides), CI 77499 (Iron Oxides), CI 77742 (Manganese Violet), CI 75470 (Carmine), CI 77007 (Ultramarines). Satin: Mica, Octyldodecyl Stearoyl Stearate, Diisostearyl Malate, Talc, Boron Nitride, PTFE, Zinc Stearate, Nylon-12, Silica, Polyethylene, Sodium Dehydroacetate, Phenoxyethanol, Sorbic Acid, Magnesium Myristate, CI 77891 (Titanium Dioxide), CI 77491 (Iron Oxides), CI 77499 (Iron Oxides), CI 77510 (Ferric Ferrocyanide), CI 75470 (Carmine). Velvet: Mica, Talc, Octyldodecyl Stearoyl Stearate, Diisostearyl Malate, Boron Nitride, PTFE, Zinc Stearate, Nylon-12, Silica, Polyethylene, Sodium Dehydroacetate, Phenoxyethanol, Sorbic Acid, Magnesium Myristate, CI 77891 (Titanium Dioxide), CI 77491 (Iron Oxides), CI 77492 (Iron Oxides), CI 77499 (Iron Oxides), CI 77742 (Manganese Violet).